With all the nifty bells and whistles being added to new portable Bluetooth speakers lately, is it still possible to get excited anymore about a new speaker? Especially one that isn’t the best looking, isn’t the best sounding, doesn’t have the longest battery life, won’t charge your smartphone and can’t be thrown from a balcony while rocking a party with 50 of your BFFs? Maybe it is possible. 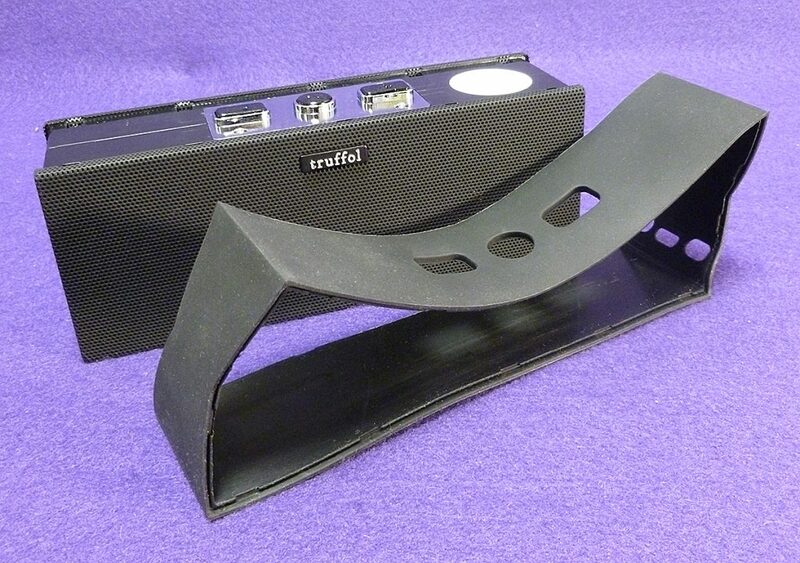 Truffol is a maker of many accessories; cases, chargers, thumb drives, cables and speakers. 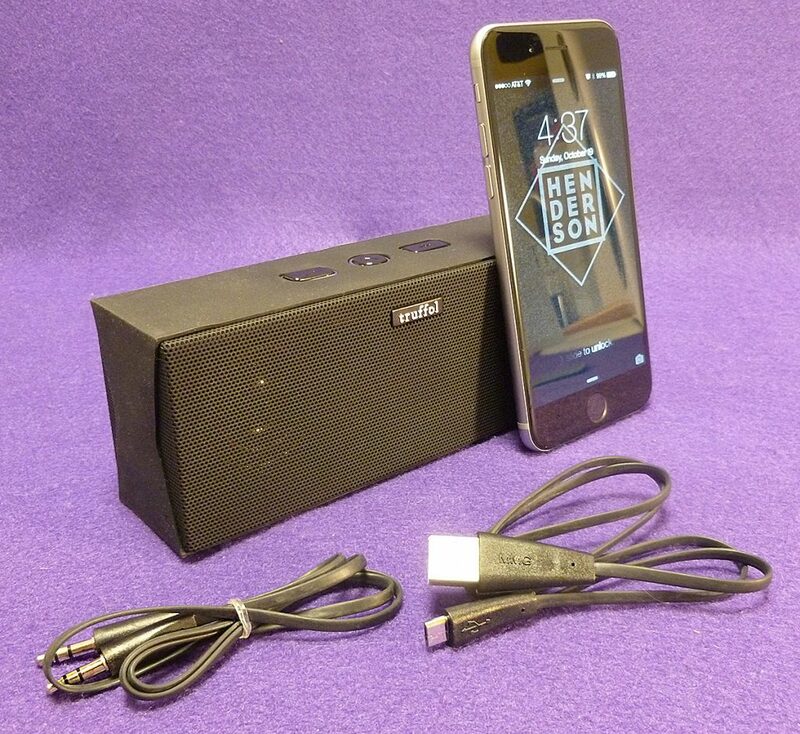 Their DuraSound Bluetooth speaker won’t win any contests as the best in anything. It’s like a perpetual bridesmaid who is never a bride with unassuming wallflower looks that won’t garner much attention. Place the DuraSound speaker on a table in any room and it will promptly blend into the decor and disappear. It only comes in 3 colors: Black (of course), aqua blue and a mustard-like yellow—not exactly a choice that excites the senses. Even the eco-packaging is plain-jane, however within that cardboard-colored wrapping is a classic black, sturdy box. All the standard stuff is included. There’s a USB cord for charging its 8 hour battery, an AUX port for a wired connection, and the common 3-button layout on top: Volume up, volume down and a center button for hands-free calling. It also has NFC for devices that are equipped with that technology. Been there, done that. 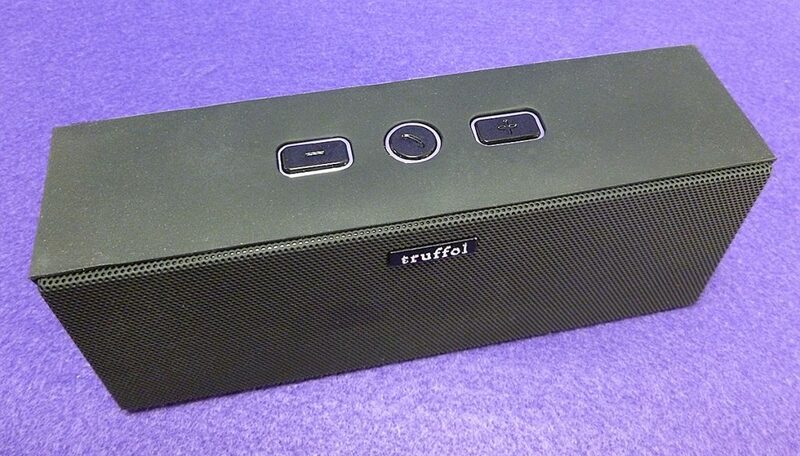 And yet, the Truffol DuraSound speaker does excite me. Even though it doesn’t do anything other speakers don’t; what it does do, it does effortlessly. From unboxing to setup, the DuraSound speaker offered no surprises or manufactured drama. It just worked. Pairing was straightforward. Just turning it on started the pairing process. It can’t be any easier than that—except maybe using NFC. But since I have an iPhone 6 which doesn’t have NFC pairing, I’ll never know. Pressing and holding the volume buttons adjusts the loudness accordingly. Quickly tapping the same buttons will skip tracks backwards and forwards on a smartphone. Like I said—simple. 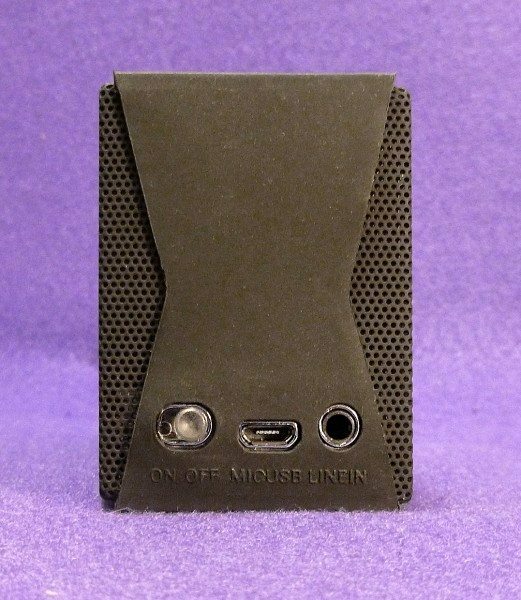 While the DuraSound speaker is nothing special to look at, it’s far from ugly. It has a classic all-business design made from silicone coated ABS plastic, This gives it an easy-to-hold nonslip grip that also sticks to any tabletop or desk. Yet, even with the silicone coating, I don’t recommend mistreating the speaker. It just doesn’t feel all that tough. The metal grille corners are exposed and prone to denting if dropped. While it is splash resistant, I also don’t recommend playing it in a hard rain shower. So what if the DuraSound speaker doesn’t win any first place trophies. There are a couple of impressive things worth noting. The sound quality is pretty darn good—not stellar, but good enough for most situations and very good for close, personal listening. But here’s where the Durasound speaker won my ears over. Call quality—something many people seldom care about. Let me explain: I was on the phone with a friend the other night and decided to use a $150 speaker I was reviewing. Well, their voice kept breaking up and they could barely hear me, regardless of any tweaking I tried to do. It was just awful. So I grabbed the DuraSound speaker out of its box on my desk and quickly paired it and voila! The call was clear on both ends of the conversation. Truffol calls this “Echo-free background noise filtering technology.” Whatever they want to call it—it really works. Here’s the kicker: This 45 dollar (yes—$45) speaker just beat the pants off a similarly sized speaker costing 3 times more! So, do the math. 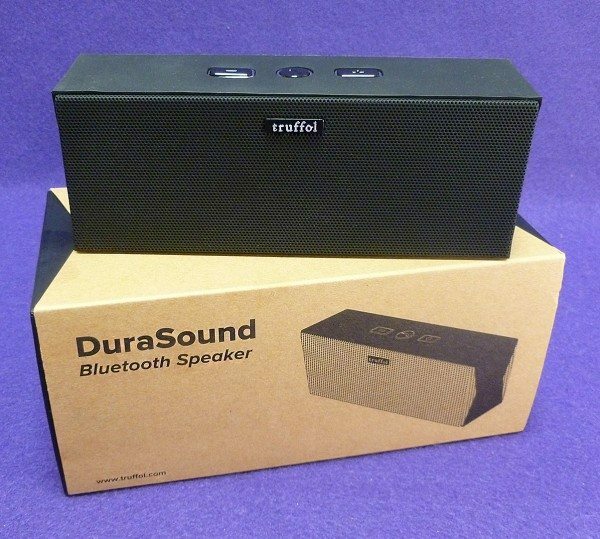 You can buy three Truffol DuraSound speakers for less than an inferior Bluetooth speaker I couldn’t even use for a simple hands-free call. Not only that, the DuraSound speaker sounds better, also. The Truffol DuraSound speaker is proof that you don’t need to spend big bucks for a personal portable Bluetooth speaker. It’s almost an impulse buy at that price. What’s not to like? Source: The sample for this review was provided by Truffol. Please visit www.truffol.com for more info.